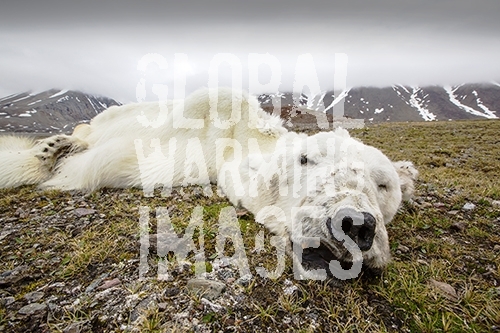 A male Polar Bear (Ursus maritimus) starved to death as a consequence of climate change. This male Polar Bear was last tracked by the Norwegian Polar Institute in April 2013 in Southern Svalbard. Polar bears need sea ice to hunt their main prey, seals. The winter of 2012/13 was one of the worst on record for sea ice extent. The western fjords on Svalbard that normally freeze in winter, remained ice free all season. This bear headed north, looking for suitable sea ice to hunt on. It travelled hundreds of miles north, finding no suitable sea ice to hunt on. It finally ran out of energy and collapsed exhausted and died. The future for Polar Bears looks bleak in a climate changing world. Recent scientific studies show that Polar Bears are getting thinner and weighing less, as they have less time to hunt in the winter and a longer fasting period in summer. Without sea ice, they starve to death.